Fire debris is collected at a fire scene as evidence and analyzed by the laboratory to determine if an ignitable liquid residue is present. This information aides the fire investigator in determining the cause of the fire. At the laboratory, any ignitable liquid residues are extracted from the fire debris prior to analysis. Analysis is performed by gas chromatography – mass spectrometry which detects and identifies the volatile components extracted from the fire debris. 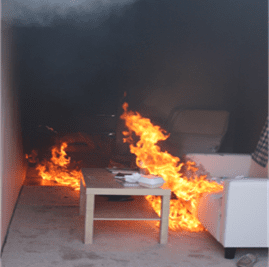 Combustion and pyrolysis products from the degradation of substrate materials such as flooring, furnishings, and construction materials interfere the in the process of determining whether an ignitable liquid residue is present in the fire debris. Other challenges are the evaporation (weathering) and consumption by bacteria of the ignitable liquid residue. 1.NCFS developed and continues to maintain and improve an online database of GC-MS data for commercially available ignitable liquids commonly found in fire debris called the Ignitable Liquids Reference Collection and Database . 2.NCFS developed and continues to maintain and improve an online database of GC-MS data for commercially available substrate materials commonly found in fire debris called the Substrate Database. 3.The determination of leak rates for various fire debris evidence collection containers. 4.A study on the adsorption process during passive headspace extraction of ignitable liquid residues using activated charcoal. 5.Development of software that compares a fire debris sample to reference ignitable liquids and substrate materials. 6.Studies on the use of statistical data analysis methods for the classification of an ignitable liquid residues such as a combined method of target factor analysis with a Bayesian classifier, linear discriminant analysis, quadratic discriminant analysis, soft independent modeling of class analogy (SIMCA), self-organizing feature maps (SOFM). 7.Investigating whether ignitable liquids group together according to the classification scheme outline by ASTM E1618 by using hierarchical cluster analysis. 8.Investigating the ability to determine the likelihood of an ignitable liquid residue being present in the fire debris. 9. Development of the International Database of Ignitable Liquids.